We checked into our hotel, the Intercontinental Grand Stanford. We chose to stay here after I saw numerous photos of their epic rooftop pool and incredible rooms. I was actually disappointed with the hotel, we booked it mainly for the pool and on arrival we were told it was closed and we couldn't use it. I was gutted, I had dreams of going to Hong Kong and swimming in one of those epic rooftop pools with panoramic city views. I didn't want to put a downer on the whole trip though so we looked at the positives instead - look at the amazing view from our room - even if it was a little bit smoggy whilst we were there! The room was clean and adequate and the service was incredible, but the view certainly made up for the lack of luxury roof top pool. I'd like to go back when the pool is actually open because it's meant to be incredible. I told you the view from our window was pretty cool. It was as if we were floating on a ship the whole time. We wandered straight out of the hotel which is in easy walking distance from everywhere in Hong Kong. The Intercontinental supply you with a free phone with data and Google maps which was honestly a life saver. We found the coolest little noodle place and filled up on a yummy, super spicy noodle broth. I became obsessed with honey and lemon water so downed a glass of that. After strolling around, we decided to head to the Jumbo floating restaurant for dinner that evening. We'd been recommended this restaurant by many people so just had to check it out. Matt went for a baked rice dish with seafood and cheese. It was like mac and cheese, ricey heaven. After the incredible meal, we got a taxi to The Peninsula. The Peninsula is probably one of the most exquisite hotels I've ever seen. It's truly beautiful. 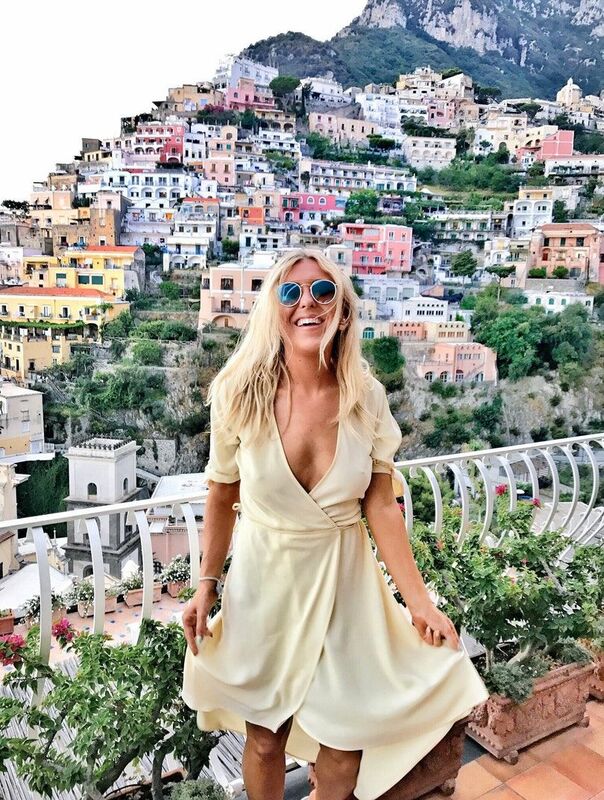 I'm a little bit obsessed with TripAdvisor and always use the app to find the best places when I'm away, Matt had a little look and chose to take me to The Peninsula for cocktails as it ranked really high. We headed up to Felix bar which was about 38 floors up and honestly one of the coolest, most beautiful, pink bars I've ever seen with incredible views. The following morning we headed down to the Intercontinental lounge. 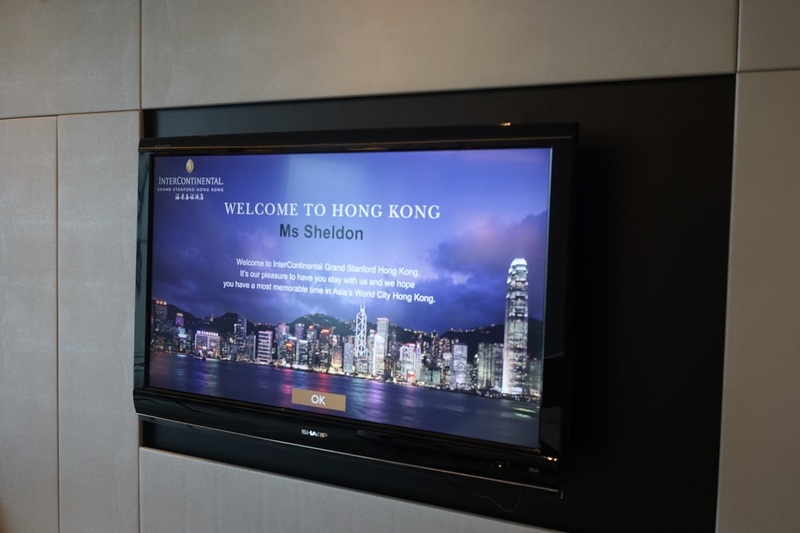 A great thing about the Intercontinental is their lounge, you can get club access by paying a little bit more and it means you get afternoon tea, nibbles, cocktails, canapés and breakfast. I filled up on the yummiest breakfast and you get really good service in the lounge too. The staff seriously can't do enough for you and it makes the stay really special, little things like them remembering my breakfast order. We chose to get a city bus pass because I always do this whilst travelling. I feel like it's the best way to see absolutely everything when you don't have too long to explore. I wore my trusty trench from ASOS again of course. It was a life saver on this trip, I didn't expect the weather to be so bad and it kept me dry and warm! We found the most gorgeous little restaurant for burgers right next to the boat so decided to grab a burger whilst we waited for the next boat to take us across to the other side of the city. 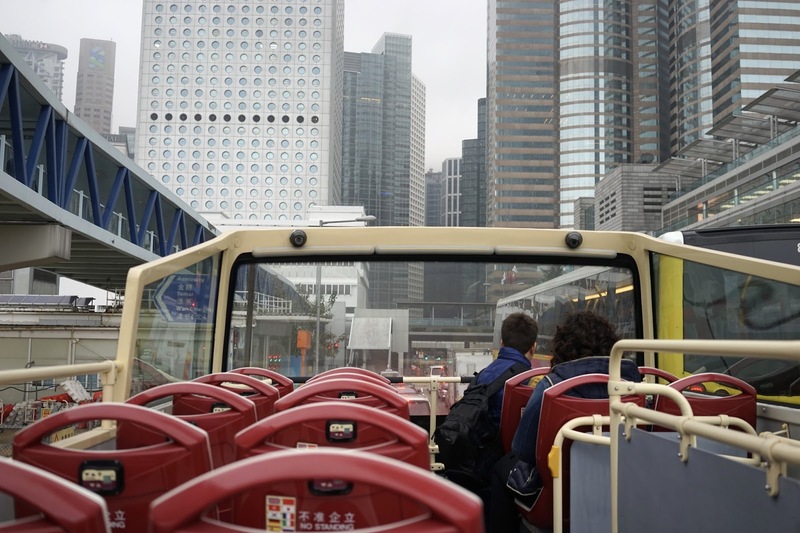 Hong Kong is great as it's split into two kind of areas and you go across either bridges in a taxi to see each side (but have to pay for toll roads), or you can get the underground or just hop on a boat across. We hopped on the boat across and jumped on our hop on hop off bus over on the other side. We went through Stanley which is hands down my favourite place ever. Here are some shots I got whilst the bus was moving, I wish we got off properly to take photos but we just didn't have the time. Stanley is like gorgeous mansions in a bay over-looking the south China sea. Whilst on the bus, we saw so much. We just sat on it for an hour and drove around the whole of Hong Kong. 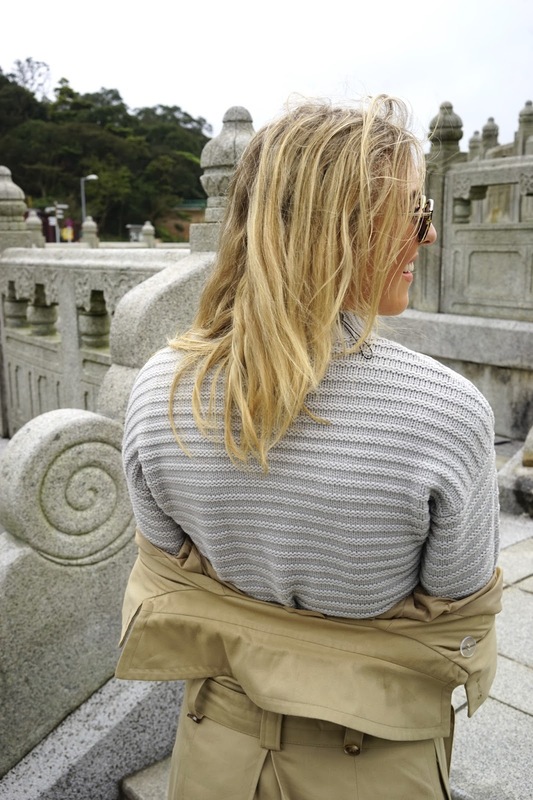 The weather wasn't on our side but it didn't make me love Hong Kong any less. It actually made me appreciate it more, anywhere can be beautiful in the sun but it takes a lot to fall madly in place with a city when it's dull and rainy. Dull, rainy Hong Kong? I love you. We grabbed a glass of champagne before dinner in the Intercontinental lounge - they give you free champagne and cocktails during their happy hour every evening which is a massive bonus and much needed after a long day of sight seeing! We jumped in a car to Aqua, the most beautiful restaurant, with incredible views too. You can still use Uber taxis in Hong Kong which is incredible, the cheapest way to get around. You can use my promo code EMTALKS15 to get £15 free in any country at any time on the Uber app if you fancy using it. It's the only way I travel in taxis! Visiting Hong Kong is expensive, the restaurants are all pretty incredible and there's a real fine dining vibe in the city. We used the Internet to make sure we were eating at only top ranked places just to ensure we were getting our moneys worth! Mornings are made for epic breakfasts and the Intercontinental Grand Stanford certainly didn't disappoint. 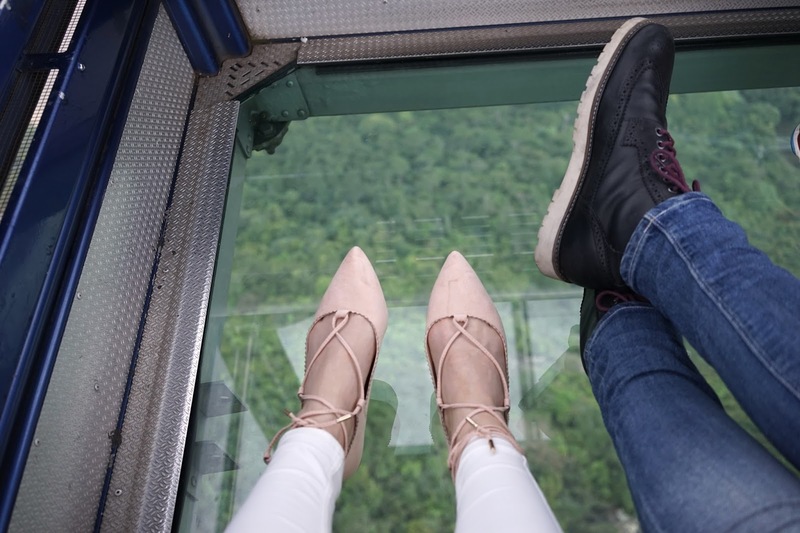 We headed to Ngong-Ping cable car for the ride of a lifetime in a glass bottom cable car. Sadly, you share a cable car with many other people - silly me expected it to be a personal cable car haha but it was still an amazing experience. I wore my new Missguided shoes, they're surprisingly comfy! Even though it was quite a murky day, the views were simply epic. We arrived in a tiny village, Ngong Ping village and saw the biggest Buddha ever. I wore my trusty mac by ASOS, my Missguided shoes, Topshop white joni jeans, my new Aspinal saddle bag and my jumper from The Fifth label. We hopped off and had a wonder around a beautiful little park. Hong Kong may be full of sky scrapers but it's also full of scenic areas too. We headed for dinner that evening with Victoria who happened to be in Hong Kong that week too. 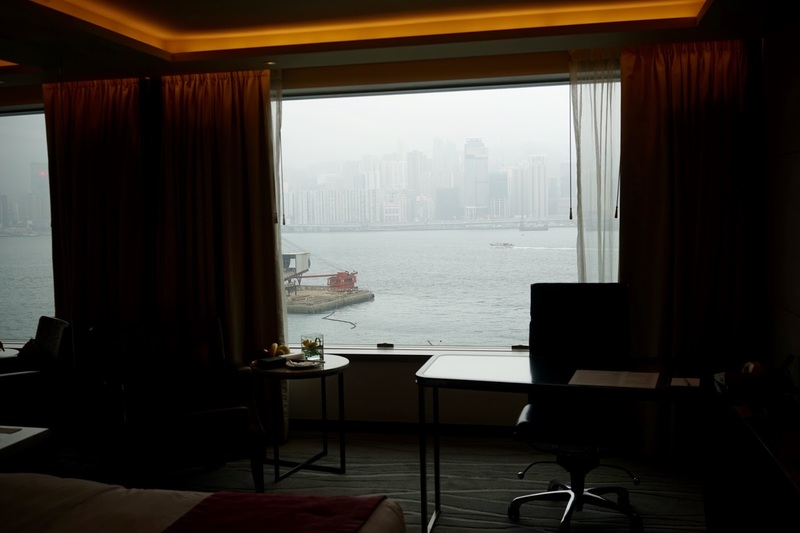 So there we have it, a very photo heavy blog post all about my 4 days in Hong Kong. There is so much to do in Hong Kong, I'd highly recommend going for longer than 4 days if you can. I can't wait to go back because there are various little islands I'd like to explore more. I wouldn't recommend going in March though as the weather just really wasn't on our side. I think I'll be going back in Summer time next time. You can watch my travel vlog below and join me on the trip, don't forget to subscribe to me on YouTube here! - it would mean the world to me. Have you ever visited Hong Kong? Do you like the look of it? Would you like to visit? Don't forget to read about my other travels here.